I’d never read Cerebus until the past month, when a friend lent me the first four volumes. Watching Sim zero in on his skills and become a better cartoonist was honestly inspiring, but the values espoused by the characters are exhausting. In the world of Cerebus, you either take advantage of people or you get taken advantage of. Characters like Julius, Astoria, and Weisshaupt seek power over others by means of manipulation, and Cerebus is apparently their foil—an example of Robert E. Howard’s pure man, untainted by civilization, who only wants to live daily by the strength of his own arm. Implicit in that “pure” go at life, though, is control over others: their subordination to him as they stay out of his way until he needs a drink or a lay. In wanting people to stay away unless they can offer him something, Cerebus exhibits a kind of privileged despotism that differs from the politicians of the book only in its assumption that what people will do outside of his view won’t affect the aardvark barbarian. The maps of Cerebus follow from this cynical, mercenary viewpoint. In most cases, they aren’t the works of fancy that are typical of the genre; they aren’t there to entice the imagination or lend a sense of realism to an otherwise fantastical world. Instead, they’re all homodiegetic—they’re assumed to “live” in the world of the story—and they all serve political ends. The first map we see is a simple floorplan for how to protect a festival floor. After that, we’re shown the breakdown of the voting districts during the Iestian election. These maps serve to illustrate the distribution of power, firstly helping to place guards during a festival, and then showing who needs to be influenced so that Cerebus can be elected prime minister. The only cartographic flights of fantasy that are allowed in the first four volumes of Cerebus are those of conquest. We see Cerebus imagine his Aardvarkian Empire in High Society, and we see that map melt out of his dreams in Church & State II. I think this is my problem with Cerebus. Even when characters are fighting for a better world—even when they’re just trying to imagineone—it’s a world that is only better for themselves. There’s no one seeking a radical rehaul of society under the auspices of equality or justice, and if someone claims to be doing that, they’re just playing for sympathy with the plebes. People don’t start with high ideologies and then become corrupted by a system; everyone starts corrupt, and the ideologies are just a veneer. This might be realism or pragmatism to some, but I’m going to continue to think that some people in the world are struggling to fight the good fight. Laura Knetzger’s Sea Urchin starts the same way many stories do: with the disruption of a status quo. “I’ve been stuck lately. The bad moods are lasting weeks.” Things aren’t how they were understood to be. What follows, though, is not a typical narrative conflict or escalation of consequences. Nor is it a typical autobiographical hand-wringing and exploration of options. Instead, Sea Urchin comes off as a chronicle of symptoms and a meditation on negative feelings. Sea Urchin’s pages seem to have more white space than other books. For instance, Knetzger’s lines are thin and consistent, and spot blacks and halftones are rare. Also, panel borders are scarce, and even when they’re present, they’re often broken by characters or design elements leaking from one panel to another. Lastly, the book is made up of a number of discrete vignettes, but there are no chapter heads or stanza breaks between them, so it can be difficult to tell where one ends and another begins. These effects combine to create a sense of slow wandering and exploration; reading the book feels a bit like wandering through a garden (a pretty sadness garden). The things growing in the garden are surprising and occasionally dangerous. 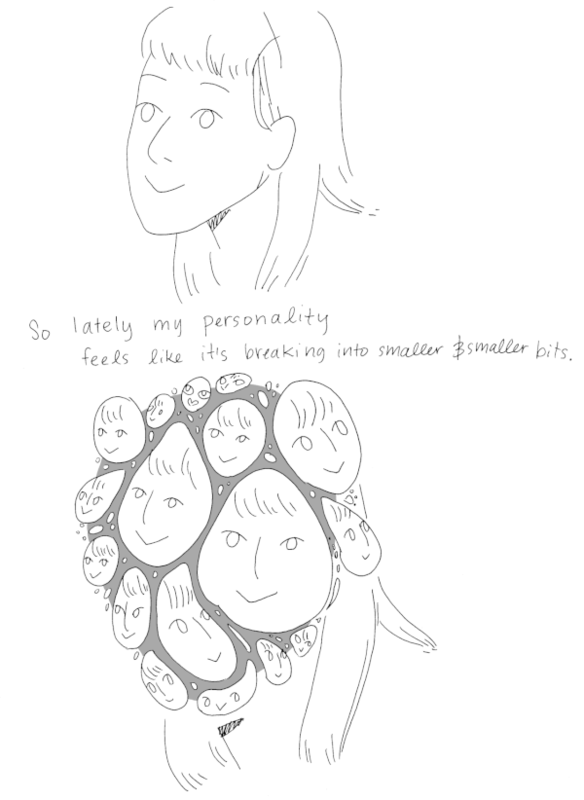 Knetzger gives her feelings imposing physical forms: black sea urchins pushing through her head, fractured faces dripping across her face, and raging anime villains. Characters grow and shrink in relation to each other and their emotional interactions. 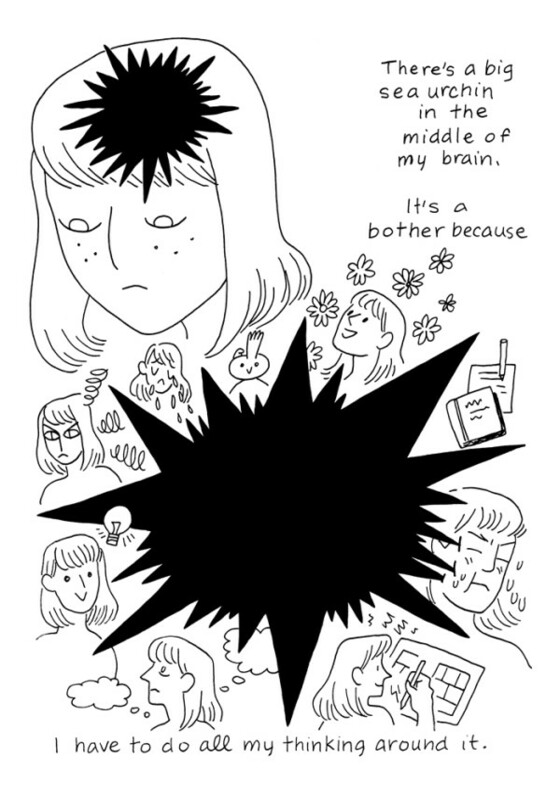 In prose (or in many autobio comics), narrators struggle to explain their negative feelings to the reader or to friends. In Sea Urchin, these feelings are more than metaphor. Knetzger’s depression isn’t like a sea urchin in her brain—it is an urchin. People with mental illnesses (or other “invisible” illnesses) often have to bear the burden of proof that something is affecting them, as though there’s a subjective element to what they’re going through. Knetzger’s stories challenge that, portraying her feelings as object facts and inviting others to walk through her life.